Posted 03.04.2016 by Fascinating Rhythm & filed under Competition. World Championship for mixed barbershop quartets in Munich. 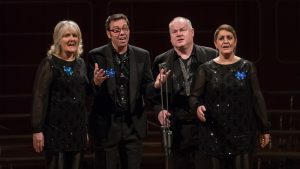 Our Tenor Section Leader Ali and her partner Pete, plus ex-FR member Donna and her partner Keefe teamed up a couple of years ago to become JIGSAW mixed quartet, winning 2 consecutive silver medals against some stiff opposition at our national yearly convention. Having decided to take part in BinG! Jigsaw felt they needed to get more stage time and actually sing to a live audience rather than just singing to the picture on the wall at home, so a plan was put in place to visit all their local choruses. Five chorus directors were contacted to seek approval to ‘Barber-bomb’ their rehearsal night. Permission granted, the quartet made all five venues one Thursday and entertained their (captive!) audiences with the two songs they were competing with. 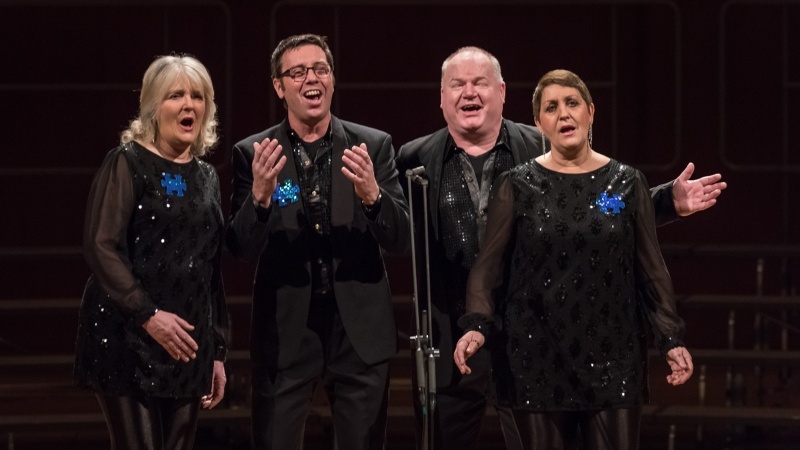 The whole evening was a great success and Jigsaw would like to thank all the choruses – Black Sheep Harmony, Bristol Fashion, Avon Harmony, Great Western Chorus and Fascinating Rhythm for their fantastic warm support. The quartet arrived in Munich on the following Thursday evening but as the competition wasn’t until Sunday made the most of their free time sightseeing around Munich, relaxing in the sun, enjoying the ambiance of the beer garden and watching the world go by! Jigsaw’s goal for the competition this year was to improve their placing and to come in the top five – which they achieved – and were over the moon to come fifth in the world, especially as the competition set a very high standard. Stop Press! Jigsaw were nominated for the 2016 A Cappella Recording Awards in the best barbershop song category with their song ‘The Way You Look Tonight’. Update April 2016 – very pleased to announce they came 2nd. Awesome!